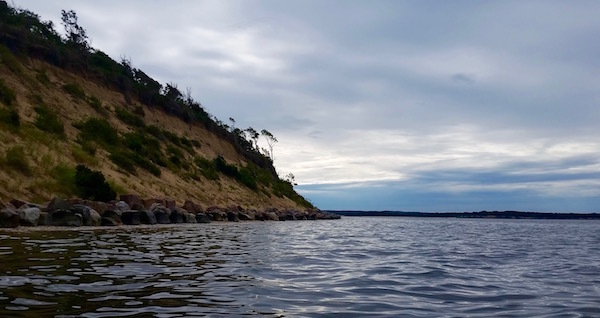 When the Peconic Estuary Program first drafted its Comprehensive Conservation Management Plan more than 15 years ago, much less was known about many environmental processes at work beneath the surface of the Peconic Bays. This year, PEP is embarking on a three-year-long process of updating its CCMP, a document that guides East End townships in their pursuit of water quality projects. 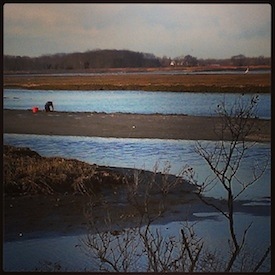 One lonely clammer worked the flats in West Creek, New Suffolk, last winter. PEP has prepared an online survey to get feedback from members of the public, and is holding just one of many public input meetings of its Citizens Advisory Committee next Monday night, Aug. 22, at Stony Brook Southampton’s Marine Sciences Research Center. Titled “Nitrogen and Our Impacts on the Estuary,” the meeting will focus on the causes of excess nitrogen in the estuary, the role of PEP and local towns in addressing the issues, research on new septic technology and East End towns’ new Water Quality Improvement Plans. The meeting will be held from 5 to 8 p.m. and the Marine Sciences Research Center is located at 239 Montauk Highway, though its entrance is on Little Neck Road just south of the highway. Summer residents, in particular, are urged to attend. “People can expect a lot of really good information on what is being done, specifically about nitrogen, in the Peconics, how it’s been handled in the past, and how we anticipate it’s going to change based on the reissue of the new CCMP,” says PEP’s Outreach and Education Coordinator, Sherryll Jones. The new plan is designed to address six areas of concern, many of which were not a major part of the original CCMP, said Ms. Jones. For example, the original document addressed brown tide, but it did not address other forms of harmful algal blooms, which have become more prevalent in recent years. It also did not address the sources of the excess nitrogen that causes algae blooms. The new plan will also focus on coastal resiliency in light of climate change. Critical land protection — avoiding excess development and protecting the coastline (which was a component of the first CCMP) — is also addressed in the new document. The document also focuses on contaminants in the estuary. The original CCMP addressed pathogens, but that term has now been broadened to include sewage and runoff, pesticides, medications and other products that can harm the health of the estuary, says Ms. Jones. 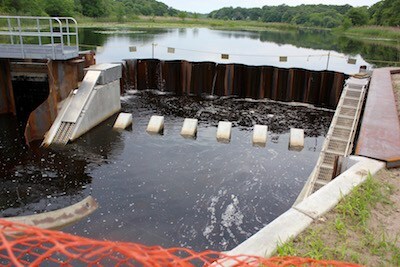 The new dam and fish ladder on the Peconic River at Edwards Avenue in Calverton. The final component, habitat restoration, has been a major feature of PEP’s work for the past decade-and-a-half, and includes restoration of salt marshes and eelgrass beds and the establishment of fish passages along the Peconic River. Ms. Jones has been working this year to put together meetings with stakeholders surrounding the estuary, including fishermen, paddlers, restaurant owners, marinas, sailing associations and boat captains. The writing of the document will begin next year, with a final draft anticipated in 2018, after which PEP will hold more public meetings looking for input. The Peconic Estuary Program, a part of the federal government’s National Estuary Program, is not allowed to influence this fall’s five-town referenda on using Community Preservation Fund money for water quality projects, because as the recipient of federal funds they are “not allowed to influence the appropriation of funding or the passage of legislation,” said Dr. Branco. The towns’ water quality plans also address similar water quality issues affecting areas of the East End that drain to the Long Island Sound, South Shore bays and coastal ponds, as well as to the Peconic Estuary. “We’re interested in improving water quality for the whole region,” said Dr. Branco. For more information about Monday’s meeting, the survey, or to schedule a community meeting on the CCMP, email Sherryll Jones at [email protected]. The public survey is online here.